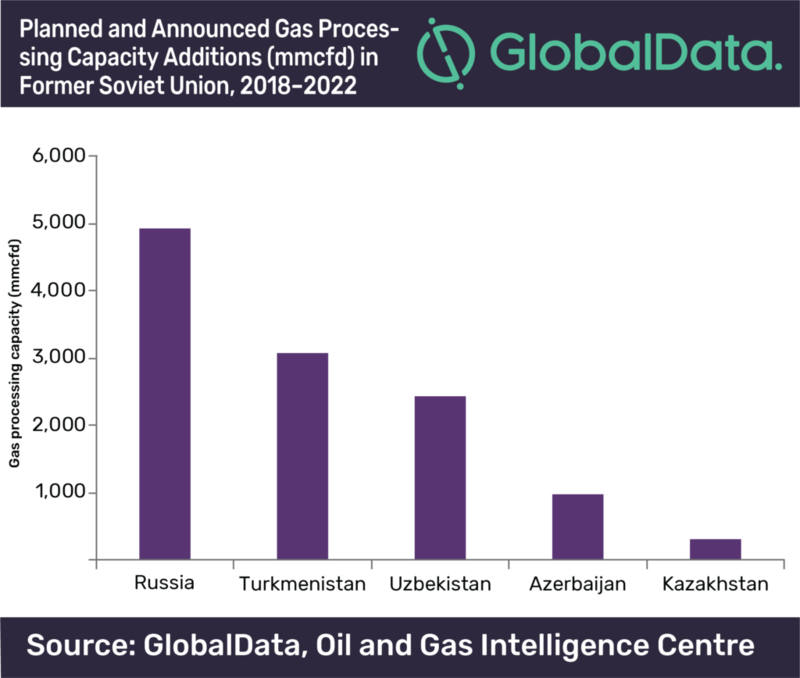 Russia will account for 42% of the total capacity additions in the gas processing industry in the Former Soviet Union between 2018 and 2022, according to GlobalData, a leading data and analytics company. The company’s report: ‘Gas Processing Industry Outlook in Former Soviet Union to 2022 – Capacity and Capital Expenditure Forecasts with Details of All Operating and Planned Processing Plants‘ reveals that the Former Soviet Union is expected to have 16 planned gas processing plants with a total processing capacity of 11,631.8 million cubic feet per day (mmcfd) by 2022. Russia is expected to add the highest gas processing capacity of 4,893.0 mmcfd from seven planned and announced gas processing plants during the forecast period. The country is expected to have capital expenditure (capex) of US$21.5bn over the next four years. GlobalData identifies Turkmenistan as the second largest country in the Former Soviet Union in terms of gas processing capacity additions. The country is expected to add around 3,063.8 mmcfd by 2022 with a planned investment of roughly US$8.7bn to be spent on the planned and announced terminals during the outlook period. Uzbekistan will be the third largest country in terms of gas processing capacity additions by 2022. The country is expected to add around 2,416.8 mmcfd from three planned and announced gas processing plants by 2022. A new-build capex of US$2.4bn is expected to be spent by the country over the four year period. The report also states that in terms of gas processing capacity among the upcoming gas processing plants, Galkynysh II in Turkmenistan, Chayandinskoye in Russia and Uzbekistan GCC in Uzbekistan will lead with 2,899.5 mmcfd, 2,029.6 mmcfd and 1,450.3 mmcfd, respectively. In terms of new build capex spending during the forecast period, Galkynysh II in Turkmenistan, Baltic II in Russia and Chayandinskoye in Russia will lead with US$7.8bn, US$6bn and US$5.6bn, respectively.